There is something inherently cool about a Jeep. Perhaps it’s knowing that your vehicle is capable of conquering almost any obstacle placed in front of it. Or maybe, it’s the rugged looks that appeal to so many enthusiasts. For those who placed their vote on the latter, you will love the new Jeep Grand Cherokee SRT Red Vapor Limited Edition. 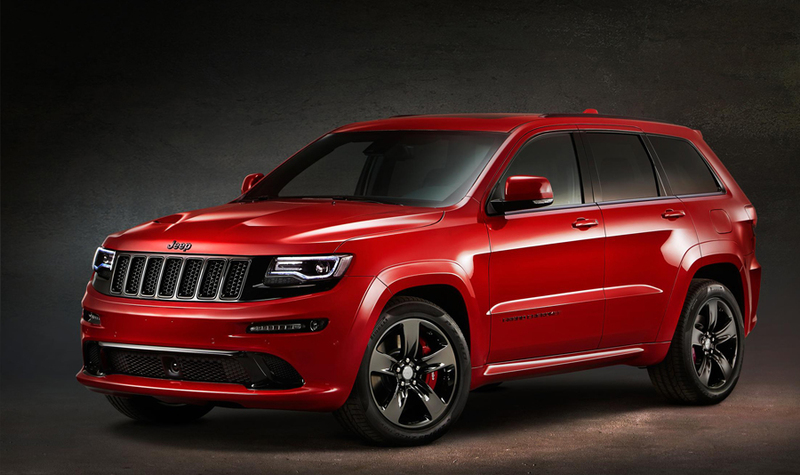 The 6.4-liter V8-powered Grand Cherokee SRT Red Vapor will offer all the presence of Jeep SRT’s legendary muscular sports styling with breath-taking performance (top speed is 160 mph and it goes 0-60 in just five seconds). First shown at last October’s Paris Motor Show, the new Jeep Grand Cherokee SRT Red Vapor comes with an assertive and attractive sports appearance, and features a host of desirable equipment befitting of the Jeep Grand Cherokee SRT badge. Unique exterior and interior styling cues enhance the car’s distinct, high-performance image. “Styled and targeted to the high performance SUV market and with an exceptional level of equipment on offer, the Grand Cherokee SRT Red Vapor will, I am sure, appeal to a whole new group of discerning customers,” says Damien Dally, head of brand, Jeep UK. The exterior features premium sports styling in the form of body colored door handles, black roof moulding, body colored sill extensions and wheel flare extensions. Five-spoke 20-inch Goliath wheels and a specific Black Vapor black chrome finish enhance the exterior while the lower grille, inserts of the upper grille, SRT tailgate badge, side Grand Cherokee badges and bonnet Jeep badge are all glossy black. Inside, a leather-wrapped steering wheel and gear changer complement the exclusive Black Laguna leather and Radar Red suede seats with unique red stitching, luxury front and rear mats and chrome pedals. The SRT badge on Red Vapor’s steering wheel is backlit, and grey chrome replaces the shiny chrome seen on SRT. The new Red Vapor is also equipped with the 8.4-inch Uconnect touchscreen display with integrated 3D navigation, advanced voice recognition, Bluetooth audio streaming and hands-free technology. In addition to good looks, the Jeep Grand Cherokee SRT Red Vapor has the off-road capabilities that you’ve come to expect from the Jeep Brand. Powered by Jeep’s proven 461bhp, 6417cc, 16-valve, V8 engine, and connected to an eight-speed automatic gearbox with steering wheel-mounted paddle controls, the SUV features Fuel Saver technology to cut fuel consumption and emissions. With Quadra-Trac ‘Active on Demand’ four wheel drive, anti-lock SRT performance disc brakes, and active damping suspension, the Red Vapor is perfect for all of your on-road and off-road adventures. Further standard features include cross-path detection, adaptive cruise control, blind spot monitoring, 825-watt Harman-Kardon audio system with 19 speakers and three sub-woofers, power tailgate, and rear light bar.